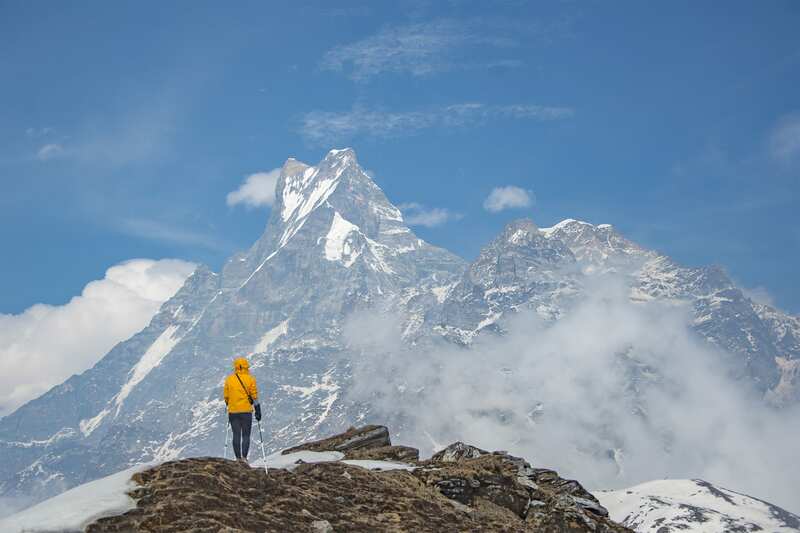 Trek to the base camps of two of the most stunning mountains in the Annapurna range on this thrilling adventure through some of the most pristine landscapes in the Himalayas. The Annapurna range stretches the skyline for 34 miles, and at its highest point reaches 26,500 feet in elevation! This impressive mountain range is composed of 30 peaks over 20,000 feet. On this circuit we will hike to the western end known as Annapurna Sanctuary and from there to the southern end at Mardi Himal Base Camp. You will be picked up from the Tribhuwan International Airport in Kathmandu. We take a short drive from the airport to our hotel. We can have a rest day today. In the evening we will have a brief description of the trip. We tour UNESCO World Heritage Sites today. These sites highlight Nepal’s cultural and religious heritages. Our first stop will be Kathmandu Durbar Square which showcases Kathmandu’s rich architectural prowess during the Malla dynasty (c1201–1769),and then Swayambhunath Stupa which tourists commonly refer to as the ‘Monkey Temple’ owing to a large number of the monkey population in the vicinity. Next is Pashupatinath Temple which is one of the most sacred pilgrimage sites for Hindus all over the world followed by the Buddhist shrine of Boudhanath which is one of the largest stupas in the world. We can enjoy the beautifully terraced farms, little shops by the side of the road and the raging Trishuli River on our drive to Pokhara also referred to as the ‘City of Lakes.’ From the city, we get great views of the Himalayas including Dhaulagiri, Manaslu, Machhapuchhre, the five peaks of Annapurna. Pokhara is also a tourist destination, so we take some time out in the evening and enjoy! On our trek to the upper viewpoint we ascend and descend, and sometimes on a steep and narrow trail. Our trail passes through pastures and we hike along a narrow ridge before reaching the Upper Viewpoint. The view of the Himalayan vista from here is astonishing. We see Mardi Himal (5587m), Annapurna I (8091m), Annapurna south (7219m), Hiunchuli (6441m), Baraha Shikhar (Mt. Fang) (7647m), Tent Peak (5695m), Singhachuli (6501m), Machapuchhre (6993m) and others. 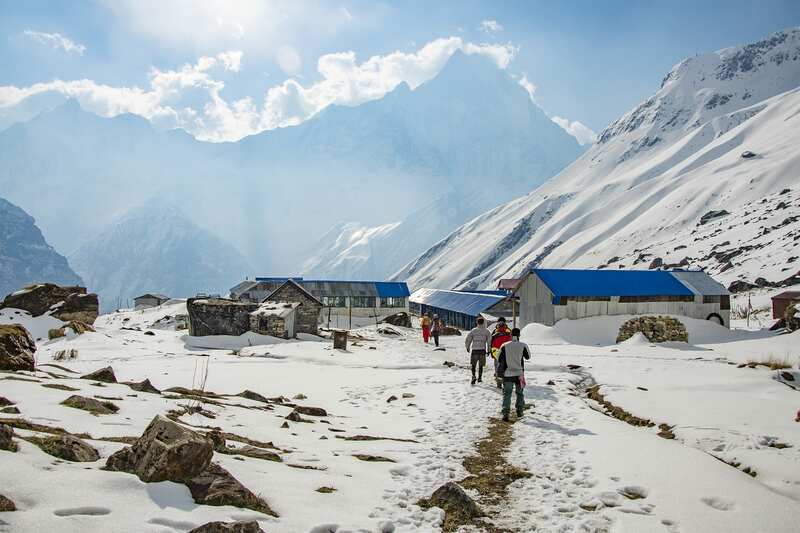 We trek back to the high camp for an overnight stay. Today we start descending from high camp straight to Landruk it will be the same way back until Forest Camp but from there we take right down hill. Landruk village is one of the largest Gurung villages we see on our trek. At this juncture, we climb down to the river called Modi river coming down from Annapurna Base Camp.On the way, we can enjoy great views of Annapurna South, Hiunchuli, Fishtail Mountain (Machhapuchhre) and Ganggapurna. A steep descend for a while and then it’s a gentle walk to Chhomrong. Chhomrong is a beautiful village located on the lap of the giant Annapurna massive. We descend via 2500 stone steps and cross the bridge above Chhomrong Khola. From here it is an uphill climb to Sinuwa. Next, we pass through a beautiful forest to Kuldihar followed by an easy downhill walk to Bamboo. Overnight in Bamboo. Climb gently through a river bed then over a steep trail over to the mountain side. The hike from Bagar to Machhapuchhre Base Camp is somewhat strenuous. 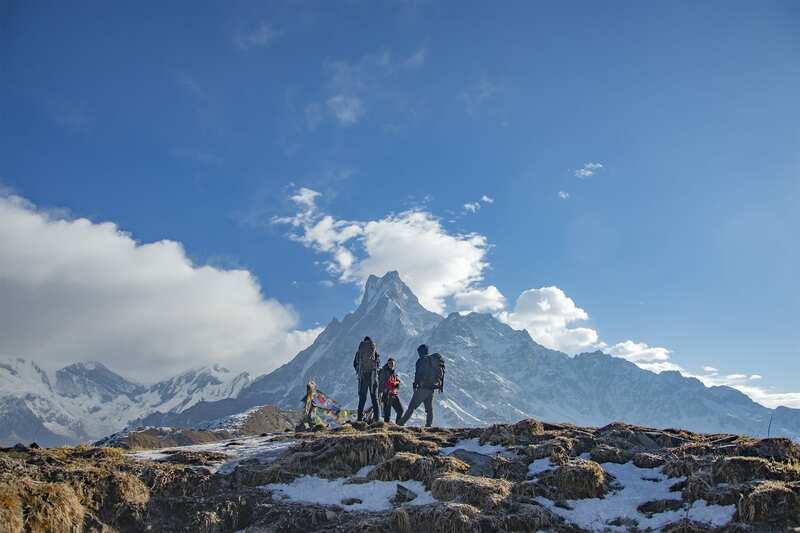 From Machhapuchhre base camp we get excellent views of the majestic Machhapuchhre along with Mt. Hiunchuli, Annapurna South, Annapurna I, Annapurna III, Gandharvachuli and Gangapurna which is certainly a rewarding experience. The vegetation disappears on our way to ABC and the path widens as we enter the Annapurna sanctuary. From here, we get sensational views of the near-vertical south face of Annapurna towering above us. The sanctuary boasts of a dynamic view without anything impeding the 360-degree panorama. 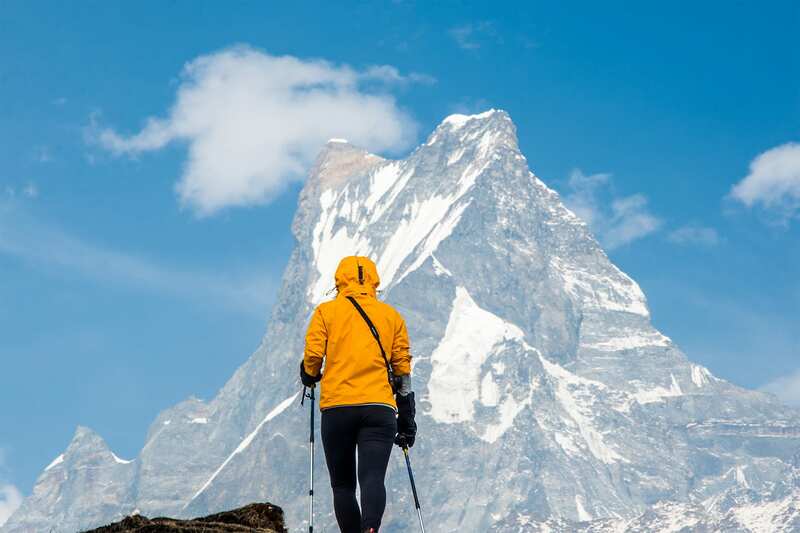 From Annapurna base camp we again get to savor mesmerizing views of the Machhapuchhre, Annapurna South , Annapurna I, Hiunchuli and other peaks. Overnight at Annapurna Base Camp. From the Annapurna base camp we retrace our steps to Bamboo. Today’s trek is downhill, so it shouldn’t be very difficult. Besides, we will always have the company of the extraordinary landscape to cheer us up. From Bamboo, it is an uphill trek to Kuldighar followed by a downhill walk to Chhomrong Khola. Then we climb the stone steps to Chhomrong. The trail then descends to Jhinu Danda, where we will be resting for the night. Today we will have an opportunity to enjoy the hot springs which is just a 15-20 minute downhill walk from Jhinu Danda to soothe our aching body. On our way to Naya Pul from Jhinu Danda, we get to enjoy the amazing hill landscape of western Nepal. We have lunch on the way. Our trek will end at Naya Pul where we board our vehicle to Pokhara. Personal expenses (Phone calls, laundry, bar bills, battery recharge, extra porters, bottle or boiled water, extra tea, shower etc. All room will have 2 beds if you want to have your own room in Kathmandu an in Pokhara there is a supplement charge (please inquire).